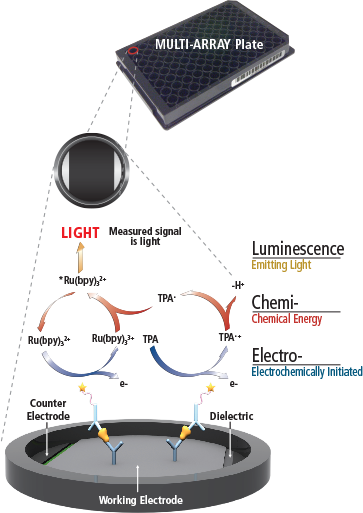 Meso Scale Discovery (MSD) is an ultra-sensitive detection platform based on the generation of an electrochemiluminescence signal from antibodies bound to an immobilized target after an electrical current is applied to the MSD detection plate. The antibodies used in MSD detection are modified to have a Sulfo-tag ™ label which catalyze a chemical reaction only activated while reading a plate. This technology is most attractive to clinical settings because it is fast and noninvasive biochemical assay. Unlike ELISA and RIA, MSD is able to work with complex matrices (such as blood and other bodily fluids) with a wider dynamic range and can work with limited sample volumes. MSD also allows for multiplexing detection by the addition of up to 10 unique detection areas within a single well of a 96-well plate and up to 4 unique detection areas within the well of a 384-well plate. A wide range of pre-defined panels exist to aid in the study of common groupings of biomarkers. In addition to these biomarker panels, the U-plex option allows customizable multiplex panels to be designed for the application of your choice. Any macromolecule can be your target with MSD! 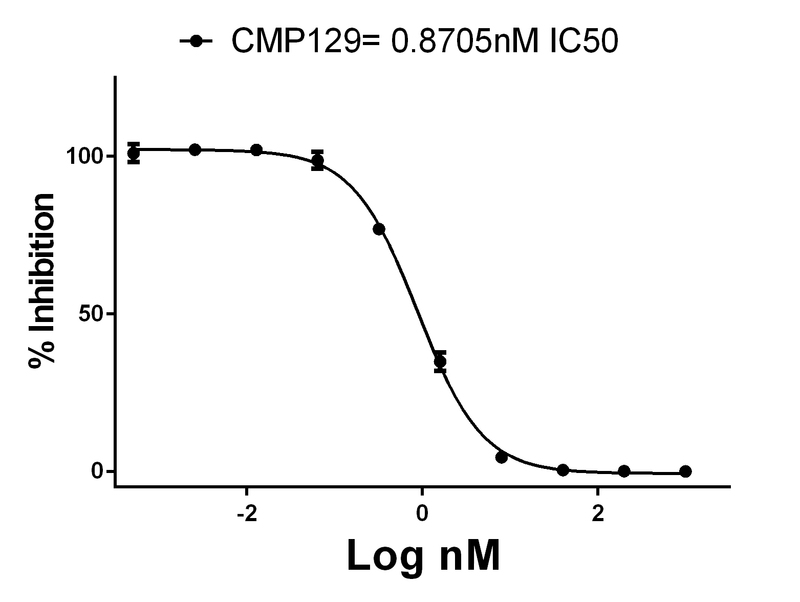 An MSD assay was used to generate an IC50 for small molecule CMP129 through detection of the product of an enzymatic reaction. MSD’s charge coupled device (CCD) cameras are sensitive enough to detect picograms of analyte, allowing for consistent data. In a 384-well format, low volume reactions allow for HTS of small molecule libraries while keeping reagent costs low.